My cats love this alot!!! If they lose their desire to eat,I put on their food and they eat their food and it,they love it!!! 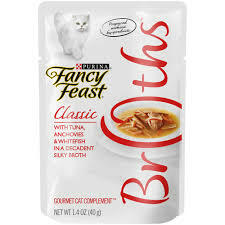 My cat love these broths as much as he loves ANYTHING edible. When he sees me with the package he attacks me to try to get me to open it faster. Then he gobbles the broth up and waits to see if he can get a refill. There are big pieces of meat along with a savory broth and he loves it.